Irish folk musician and producer Dónal Lunny plays left-handed guitar and bouzouki, as well as keyboards and bodhrán. Dónal Lunny is popularly regarded as having being central to the renaissance of Irish Music over the last three decades. 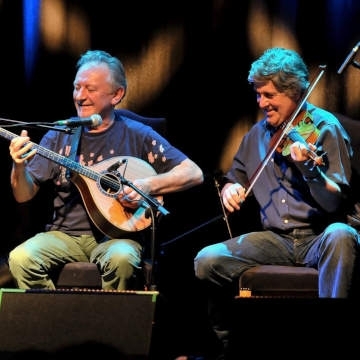 Since the seventies Dónal Lunny has had involvement with some of the most innovative bands to emerge from Ireland including Planxty, the Bothy Band, Moving Hearts, Coolfin, and more recently Mozaik. He has toured across the world, collaborating with musicians of many different cultures. Paddy Glackin, also a founding member of Bothy Band, is widely regarded as one of Ireland’s leading traditional fiddle players of his generation. Being reared in Dublin, Paddy was exposed to a wide variety of regional styles that influenced his music and was hugely encouraged by such players as Sligo flute player John Egan, and Clare fiddler John Kelly. Paddy Glackin has also recorded extensively and collaborated with a range of musicians including avant-garde composer John Cage, Micheal O Suilleabhain, piper Liam O Flynn, and Dónal Lunny. He also played in groups such as Ceoltoiri Laighean and LAPD and is currently a member of Ushers Island.